Mahindra Rodeo is proving to be a stiff competition for other scooters in its class. Read about the specifications and price of Mahindra Rodeo in India. Mahindra & Mahindra (M&M), one of the established names in the Indian automotive industry, is all set to capture the scooter segment of the market, with its launch of appealing scooters. After the launch of 'Flyte' in early 2009, the company rolled out its 'Rodeo' and 'Duro' in November 2009. Mahindra Rodeo is synonymous to style and comfort. The 125cc two-wheeler is appealing with its looks and gets a thumbs-up for its utility factor and performance. The scooter is available in seven different shades. With some add-on features, Mahindra Rodeo offers you true value for money! The 4 stroke, 124.6cc (approximately 125cc) petrol engine of Mahindra Rodeo generates maximum power of 8 bhp at 7000 rpm and churns out maximum torque of 9 Nm at 5500 rpm. The gearless automobile gives you the options of self and kick start to choose from. 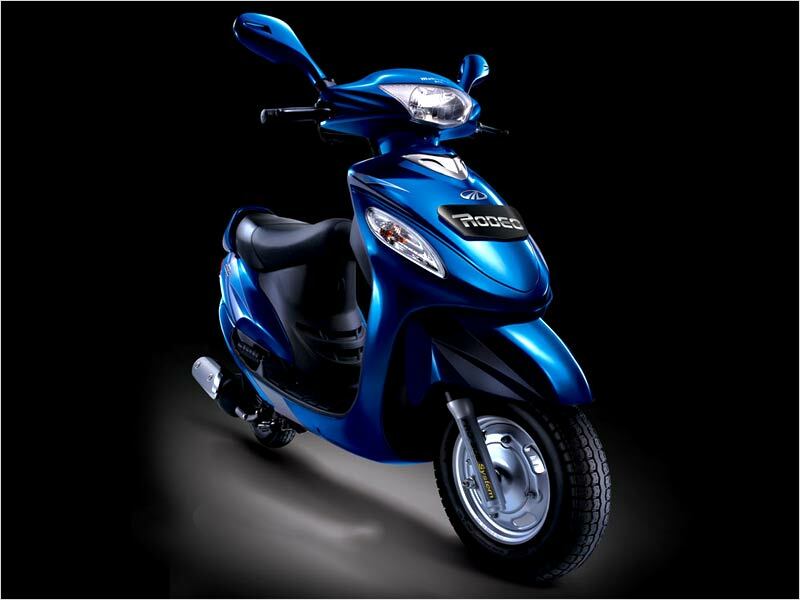 With a top speed of 80 km/h, you can navigate effortlessly through the uneven Indian roads as well as smooth highways. Stylishly designed Mahindra Rodeo is truly a head turner! The automobile flaunts an aggressive front, which is quiet refreshing. 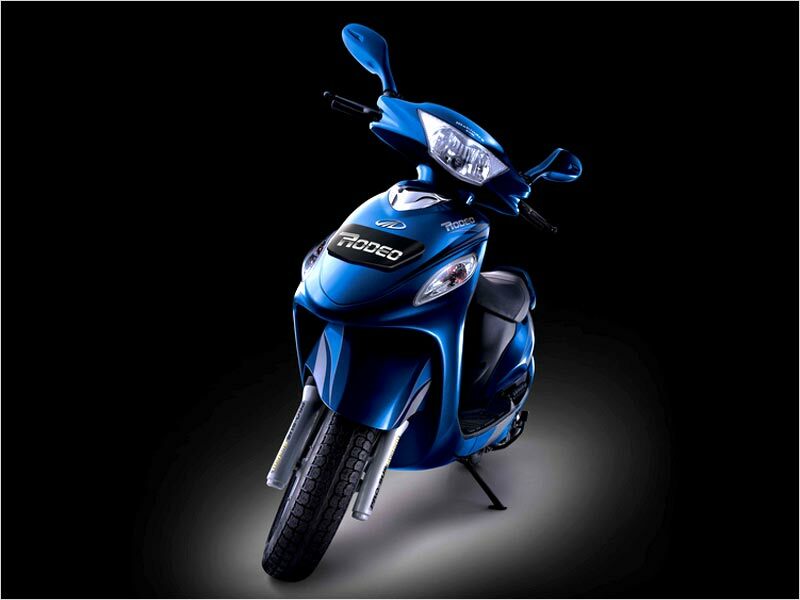 Sporty body graphics, body colored mirrors and horn rimmed headlamp add to the appeal of the scooter. 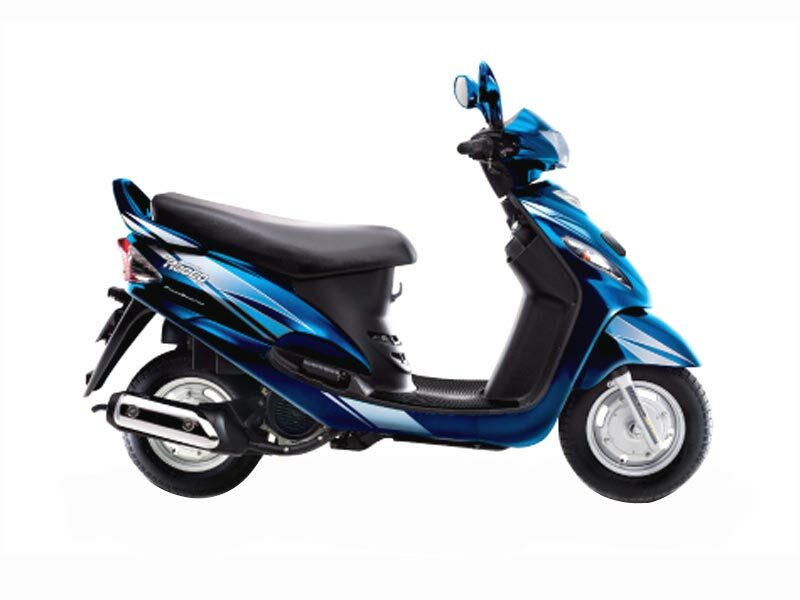 Vital signals of the 'power scooter' are easily visible on its digital display that includes tachometer, tripmeter, acceleration indicator, odometer, speedometer, fuel gauge and a clock. The under seat cover is also quiet roomy, which offers you sufficient space to store your kitty and helmet. The thoughtfully integrated charging point of Mahindra Rodeo is a plus point of the scooter. So, you can power your iPod, mobile phone and Mp3 player on the move! Ride and handling of Mahindra Rodeo is considered to be one of the best in the scooter segment. Rodeo's powerful battery, when super-charged, delivers great power that results in a clearer horn, brighter headlight and instant start-up. The streamlined bodywork of the automobile makes it aesthetic and aerodynamic, which are much needed for better ride and handling. Rodeo's enhanced brakes ensure that your handling remains surefooted even on pot-holed roads. The 4-in-one Antitheft Key centrally locks the entire vehicle with just one turn. All you need to do is just lock the handle and the fuel tank. With the anti-theft magnetic key, the keyhole is covered with a solid shutter, which restricts any further entry. Offered with a front fuelling design, Mahindra Rodeo provides an average of 37-40 km/l. Mahindra Rodeo is available in seven stunning colors that include Majestic Maroon, Golden Beige, Forest Green, Fiery Black, Deep Ocean Blue, Cappuccino Brown and Blazing Red. Rodeo comes with a price tag ranging from Rs 41299 (approx).